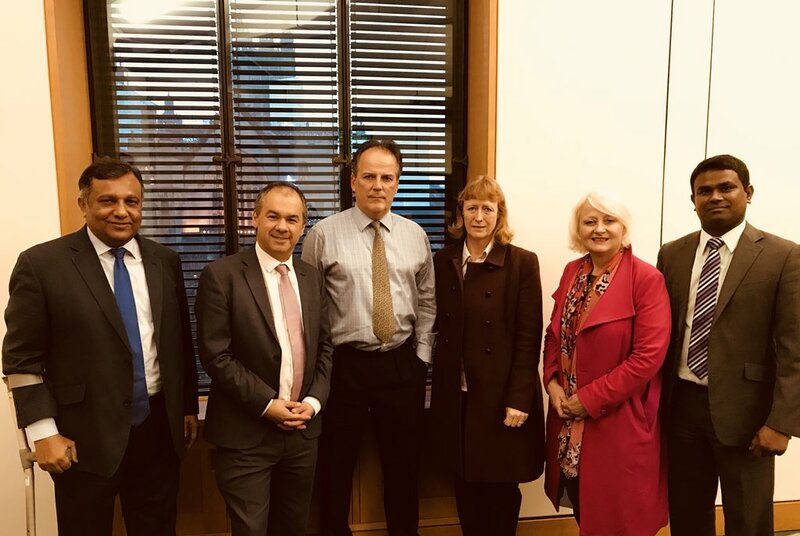 The UK's All Party Parliamentary Group on Tamils (APPGT) today met with the Minister of State for the Foreign and Commonwealth Office, Mark Field, urging him to take action on Sri Lanka. Highlighting Sri Lanka's failure to implement commitments agreed to in the co-sponsored UN Human Rights Council resolution 30/1, the delegation of cross party MPs called for more pressure to be applied ahead of the next Council session in March 2019. MPs, Paul Scully, Joan Ryan and Siobhain McDonagh accompanied by members of the British Tamils Forum, also discussed the current political crisis in the country. "Good to speak to the APPG on Tamils. Discussed deep concerns surrounding current political situation in #SriLanka and reiterated our call for all parties to uphold constitution and due political process. Will continue to urge Sri Lanka to implement commitments under #UNHRC," Field tweeted following the meeting. In a letter to the British foreign secretary, Jeremy Hunt, in the days following the Sri Lankan president's sacking of the prime minister, the APPGT questioned what action the UK government had been taking to ensure political stability on the island and called for talks on the suspension of trade concessions. The letter, signed by the APPGT chair, Paul Scully MP as well as Edward Davey MP, Tom Brake MP, Theresa Villiers MP, Siobhain McDonagh MP, Zac Goldsmith MP, Wes Streeting MP, Bob Blackman MP, Joan Ryan MP, Stephen Timms MP, Mike Gapes MP and Virendra Sharma MP, also highlighting the risk faced by Tamils following Rajapaksa's return to power and called on Hunt to address the House on this issue as soon as possible. "A large proportion of the Tamil diaspora lives in the UK, including many in our constituencies; the thought of Mahinda Rajapaksa becoming Prime Minister causes great distress for Tamils in the UK and back in Sri Lanka. The threat of Mahinda Rajapaksa stoking nationalist divisions in Sri Lanka which previously fuelled the decades long civil war is very real and must not be dismissed by the international community."